At the end of their August classes, the Tech Know Quilter members were challenged to apply what they learned. All I can say is WOW! This is an incredibly talented group of designers. Check out their latest works along with comments. Wanda Hizer I took the Intoduction to Applique. I also learned to make a free motion quilting design. Enjoyed the class. Wanda Hizer Here is another quilt I did in the class using wreathmaker. Fun class. Holly Wilson - I learned so many things! Feeling comfortable with my skills I learned is one of the best things! Nicola Manton Learned so much from the Applique course - had the best time playing. Pat Harkin Put all I learned to design this quilt which I am making now. The 4 young men are brothers and wonderful musicians. This is the cover of their first CD. Laura Sapko For this quilt I combined pieced with appliqué after catching up on all the appliqué lessons. The Bride's Bouquet was made using the Starburst lesson. I've wanted to make that block for some time but didn't have a pattern... now I do! Paula Miceli This is my completed quilt from the Intro to Applique class. EQ Applique was totally new to me. Wreathmaker is my new favorite tool! Susan Sorensen Intro to Applique challenge. I wanted to master the process of turning motifs into blocks, making the vines, and creating the faux overlap. Playing with the wreath and posy makers for the stars was just plain fun. Debbie Wheadon Even a few tweaks can create something fab with the teaching Kari gives. This simple wall-hanging uses a number of earlier basic skills learnt. From capturing and bringing in a fabric swatch, designing a log cabin block from scratch, working with serendipity, setting borders a little different, and the applique class picking EQs own motifs then altering and resizing them. Kathy Delaney Whew! I think I got it! Wow! That WAS a challenge! Loved the lessons. Mary Montayne This class was so much fun and I can't believe how all the classes/lessons are coming together. I used many of of the techniques taught in Introduction to Applique for the quilt I designed. Julie Pedersen I did the Applique Challenge. Choosing one thing that I learn in month from Kari Schell is impossible! Thanks for all you teach us! Joyce D. This month's topic could not have come at a better time. My 3 granddaughters wanted to make a personalized quilt. At 11 years of age, Maia dances in a troupe so selected a stock image as her focal point and a favorite quote, I traced her figure and we added the text. Together we sat as she maneuvered these to her liking. She loves her material selections. Janet Kirby This is my Applique Quilt Challenge. One of the lessons I enjoyed the most was recreating an antique applique quilt from a picture. Kristy S. Introduction to Applique Challenge Quilt...I continue to learn a multitude of skills with each new class. Joy Hegglund Learned a lot about importing and tracing images and had fun with wreathmaker. Joyce Brenton I chose one of my favorite cartoon characters. I downloaded it from a cartoon pic and used EQ’s drawing and shapes tools to trace it and to create the applique I wanted. I also used the thread tools to mark the stitching lines and created a quilting pattern for the background lines. Sharon Osborne I used the blocks that I designed during August. Really fun and I learned a lot! Maureen Barber Here is my challenge quilt from the Introduction to Applique classes. I had fun playing with wreathmaker. Laura Sapko Quilt Challenge! I definitely had fun with this challenge and month of appliqué lessons! It's been a non stop couple days of making all these blocks for this quilt and I am sooooooo excited to start cutting them when I receive my NEW Brother Scan n Cut 650!!! Kristin Johnson Conant I decided to make the quilt I designed for the Gee’s Bend challenge, for a very dear friend who is very sick. This one is called Mama’s Song and music is an important part of my life and his. I want him to feel the love when he wraps himself in the quilt. Ann Hibbs Using lessons learned in the Intro to Applique class, I traced elements of a Norwegian Rosemaling motif to create this block. I still need to add stems and some other elements, but it's a start! Linda Carlson I started with a single palm frond, added Kaleidoscope rotations, etc. Madeline Brown Mix and Match Medallions - This block was a nine patch variation and using some cornering and the arc tool, then cloning it was transformed to a new block that included a cathedral window.. Rotating it in a quilt formed a secondary design. Bibi Bellotto This is my Applique Challenge. I scanned my patriotic fabric, cropped the motifs from the fabric and traced them for the appliques, used the horizontal strip layout, as well as many other skills Kari has taught us. I've been thinking about doing this quilt for over two years. I'm actually making it now! I'm quite pleased! Thank you so much, Kari. Here is your opportunity to see EQ8 in action and decide whether a quilting design software is for you. Kari takes you through the basic navigation of EQ8. You'll create a new project using the libraries, Quick Quilts for fast projects, adding borders, coloring tools and fabric. Create quilt labels and printing quilt blocks, yardage estimates, rotary cutting and foundation patterns. By the end of the class you will be comfortable working with the program and be able to explore additional features on your own. Users of all levels are welcome, with special emphasis on beginners. Register here. Prepare to be educated as I describe my design process, show beautiful quilts and demonstrate useful tools. Have you been following along with the Electric Quilt Design Revolution? In Video 1, you were introduced to Mix and Match Quilts using EQ8 which provided you a simple way to get started designing your own quilts using Electric Quilt 8. If you missed the video start by downloading your copy of Part 1 - Mix and Match Quilts Blueprint. Then watch video #1 here. In Video 2, you learned 5 Fast Ways to Add a Creative Touch using EQ8. Download the blueprint referenced in the video. Then watch video #2 here. In Video 3, you were introduced to the Electric Quilt Success Path. 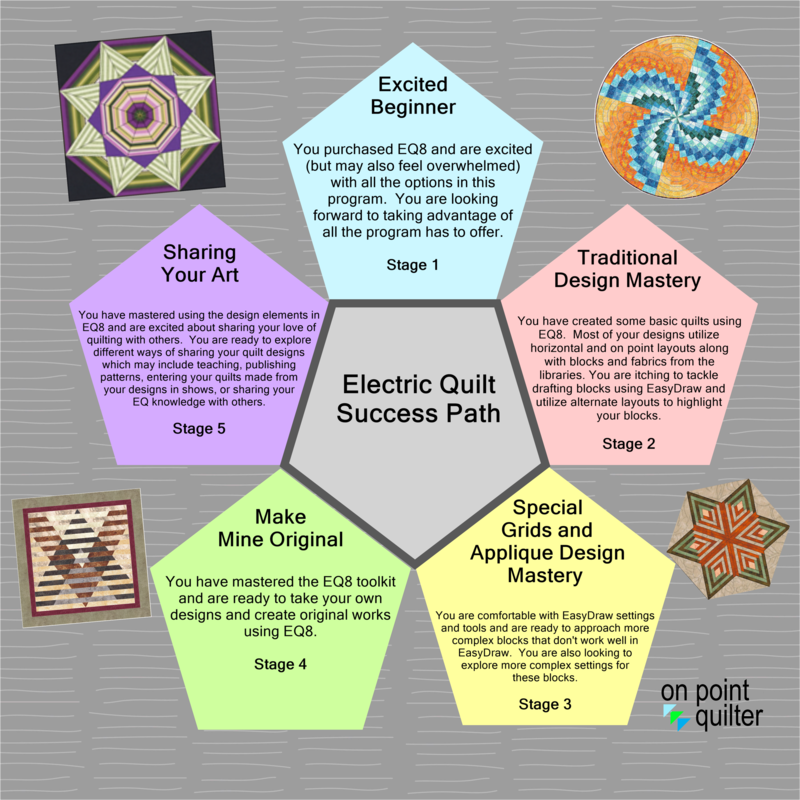 In this video you were shown how to create a structure for learning Electric Quilt plus, you'll learned what to work on during each stage of the journey... without being overwhelmed with all EQ8 has to offer. Download the EQ8 Success Path Blueprint. Then watch video #3 here. Tech Know Quilters is your key to making that happen. See how in video #4. I’d like to invite you to join Tech Know Quilters! Join the Tech Know Quilters Subscription Program now! PS - Registration for Tech Know Quilters is only available until September 28 at 11:59 PDT. Join Now! When on the path to designing your own quilts, a lot of quilters miss a key point. I’m sharing this with you in video #2. Download the blueprint referenced in the video. Ready for less overwhelm with using Electric Quilt? An easier way to finally design your own quilts? Then you’ll want to check this out! Did you miss Video #1? You can check it out here. You’ve tried to get started designing your own quilts, but there’s always something which gets in your way. And if you’re like most of us, we can easily get overwhelmed with the complexity of design software. Frankly, you’re tired of being confined to making quilts from published patterns and want to design your own quilts. My free video series the Electric Quilt Design Revolution shares how creative quilters like you and me can get started designing in EQ8. Start by downloading your free copy of Part 1 - Mix and Match Quilts Blueprint. You can use this guide for implementing the information from the video. Ready to get started designing in EQ8 without being stressed with the complexity of the software?